As the temperature outside begins to increase, so does the number of birds and pests, specifically pigeons. Springtime and warmer weather are typically synonymous with insect and animal reproduction. Pigeons, however, are known to breed throughout the entire year, each female having around five babies in that time. So why does there seem to be an influx of pigeons as the weather heats up? Simply put, the answer is food! Pigeons are scavengers and will eat anything from insects to seeds to garbage. The nicer it gets outside, the more likely people are to have picnics, hold outdoor events, and host barbeques. The moment a pigeon finds an abundant source of food, they post up, take residence, and start reproducing. While pigeons, themselves, aren’t particularly dangerous, their poo can pack a powerful punch! Not only can their droppings contain a plethora of diseases such as salmonella and cryptococcosis, pigeon poop is heavily acidic. The dangerous doo-doo can erode roofing shingles and cause unsightly damage to structures over time. Each pigeon will defecate around forty times a day making their #2 your #1 problem. Pigeons might not seem like to smartest bird in the bunch as you watch them waddle around your neighborhood, pecking at discarded wrappers. But believe it or not, pigeons have been known to test higher in math than an average 3-year-old! They even recognize faces, especially if those faces belong to people who leave the trash can lid open on garbage day. However, it’s not just leftovers that attracts the nuisance: if you have an environment that is suitable for insects, pigeons will gladly flock towards the buggy buffet. Keeping your property regularly sprayed and free of trash and debris is the best defense against most of your pesky pests. 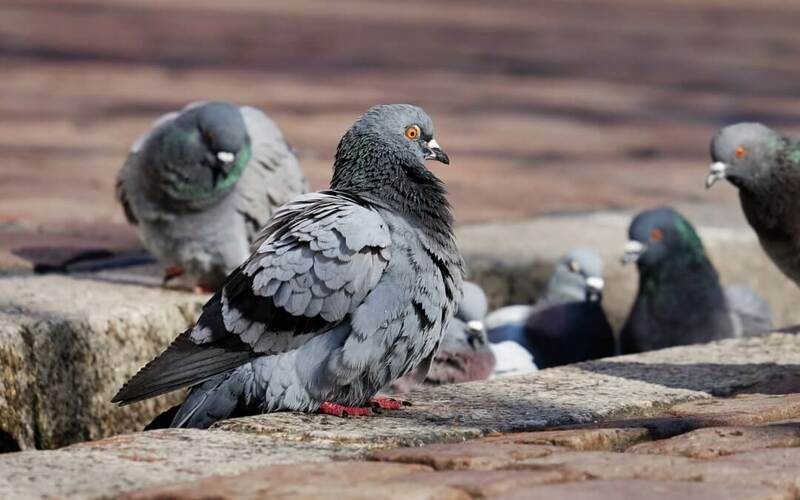 Whether it was due to the neighborhood “pigeon lady” or from a particularly messy pool party, if your property has become infested with eight or more pigeons, it’s time to get them removed. Along with troubling turds, pigeon nests can be hazardous too. They can block vents and drains or ignite fires when built too closely to electrical systems. Pigeon removal may seem trivial, but you’ll be thanking your lucky stars that you called Tri-X Pest Management before your pigeon problem got too messy to handle!